We are situated in the seaside village of Kovalam, in Kerala, South India. From Kailasam, it’s just 3 minutes’ walk to the sandy Lighthouse Beach and the Arabian Sea. We provide a peaceful and homely base – but with the advantage of being part of Kovalam village so you can experience the ‘real India’ whilst still getting away from it all. 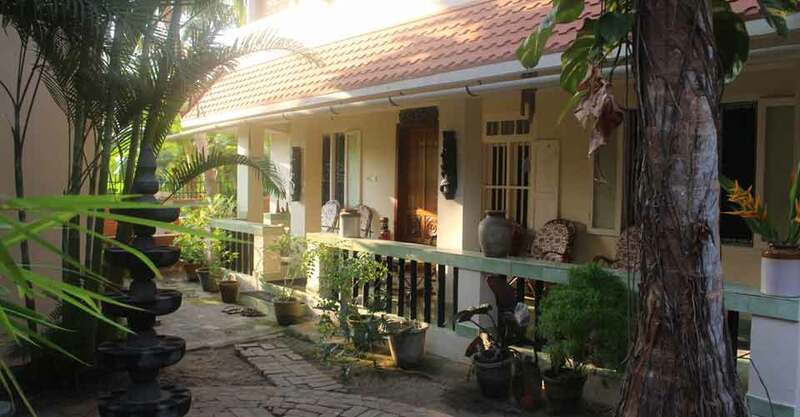 Kailasam was originally a private house, which has been extended and converted to a yoga centre – a calm oasis, set amongst lush vegetation, away from any road, and reached only by a footpath through the coconut groves. 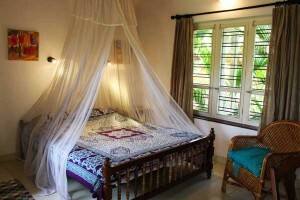 There are eight guest bedrooms, yoga shala, relaxation areas and dining areas, all within a beautiful garden. We can accommodate up to 11 people on site, in single and shared bedrooms, and we also use two or three rooms nearby for the most popular times of the year. All rooms are en-suite – simple but comfortable, individually decorated, with ceiling fans, mosquito nets on windows and over beds, hot showers and western-style toilets. We provide free WiFi for guests’ use. Upstairs is our lovely dining area where we serve delicious and generous breakfasts. The fare is western-style, fresh and tropical. You can use the kitchen to make yourself a tea, coffee or herb-tea any time, day or night, and we provide complimentary drinking water. The shaded, relaxation roof with its day beds, is a favourite with our guests – great for chilling-out after a massage or catching up with that novel.